Liquor is a classy gift fit for any occasion, but when you're shopping for the love of your life it's even more important to get the best. This Valentine's Day surprise your man with a spirits gift basket that he'll enjoy for months to come. Your partner will have 2 new bottles of liquor to proudly display. First a bottle of Hennessy V.S.O.P Cognac (750 ml) full bodied, and perfect for sipping neat, on the rocks, or mixed with their favorite soda. They'll also enjoy a bottle of Martell VS Cognac (750 ml), a heady flavor made for slow slipping in their favorite chair. 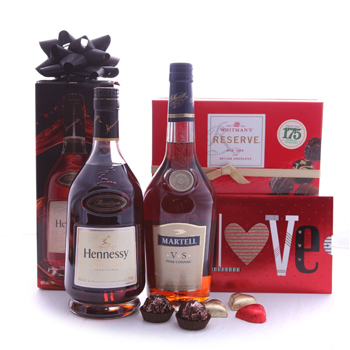 They'll enjoy a bottle of gourmet assorted Chocolates (150 grams) to make their evening even sweeter. A Pair For Gentlemen is the perfect gift for a partner with refined tastes this Valentine's Day.